Excited to be on the way back to Africa, so honored to join Johannes Amritzer and the Mission SOS team in Addis Ababa. This has the potential to be the largest event in Mission SOS history, because Addis is the largest city that has hosted an SOS Festival. We project at least 25,000 people per night. I have to be honest. I’m praying that we’ll see at least one night with 100K people, or more. Will you agree in prayer with us and the Mission SOS team to shake the city? There are over 100 ethnic people groups in Ethiopia and 33 of them are unreached. That’s almost 30%. Over 20 million people are considered unreached with the Gospel. In addition to the street meetings and festival outreach, we are ecstatic to partner with Mission SOS for the Book of Acts School as they train over 2,000 young adults in Addis Ababa. Think of the eternal impact of a nation whose youth is on fire to reach the unreached of their nation. Missionaries are being raised up here. There are 3.2 million people in the capital city, Addis Ababa. This a key place to preach the Gospel of Jesus. We are thrilled to be joining 150 wildly passionate missionaries on the field including 16 TC Africa leaders. All will be praying for healing, deliverance and salvation, as we put our boots on the ground in Addis Ababa, Ethiopia. God has given us a miracle! Despite marshal law which bans street meetings and public gatherings, we not only have permits for the festival but also for daily street meetings! You joined us in prayer and fasting, the Mission SOS team interceded, and God gave supernatural favor in an impossible situation. But don't stop praying now! All of the stage, lighting and sound equipment, in transit from Tanzania, is stranded in Kenya. Somewhere in the wilds of Kenya's Savanna, is the lighting, sound, stage and street systems. Please pray for a swift release and safe travel into Addis Ababa. We are extremely excited about the team that God has gathered for the upcoming Mission SOS. Our ALL AFRICA team of 16 amazing TC leaders from 10 nations will join the team of 150 international missionaries in Addis Ababa, Ethiopia. As you peruse the pictures, please ask the Holy Spirit to draw you to one or two that you can adopt in prayer for the next 21 days. As you pray for them, also lift up Brother Johannes, Fernando, Peter, and the entire Mission SOS leadership team. Come behind the scenes with Johannes Armritzer and us at the UGANDA SOS Signs and Wonders Festival. Join us on the street, and meet the team, including TC students, staff and graduates, that God used in Kampala, Uganda. I know the reach of this E-votion goes far beyond spiritual sons. Some of you are fathers (or mothers). Others are friends or co-workers. But all of you are powerful partners in miracles. We are reaching the world together. The apostle Paul, writing to a treasured friend, starts his letter with grace, in the middle shares the three tenses of grace, and finishes his letter with grace. possession, zealous for good deeds. I have so many theories and opinions on how God should work, and more importantly, how I should act in light of His love. In the end, I find myself falling desperately short of doing my part in that relationship. I not only fail to meet scriptural expectations or the expectations of those around me--I can’t even measure up to my own expectations. That is where grace comes in. God’s grace is the working of His life within us. That is the reason it is so important to understand the three tenses of grace that the apostle Paul shares. Grace is more than mercy. It is more than justice. Someone steals a car from a neighbor and is caught. Justice cries out, “You must be punished, pay for the car and return it immediately. Grace is the neighbor offering forgiveness and buying him a new car as a free gift! Grace SAVED. Verse 11 addresses the declaration -- past tense –“Grace has already appeared, bringing salvation to ALL.” No one is outside of the reach of His promise. Grace is a promise--unmerited, unexpected, and undeserved. More than that, grace is expensive.” Jesus paid for my sin and failures with His sinless life and sacrificial death. For some, the tents of the Kule Camp are the last hope for refuge. We will take a team there to minister on Friday. 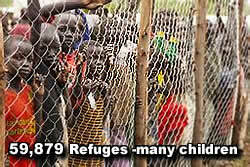 59,879 refugees, many of them children, live in the Kule refugee camp, about 50 kilometers from the South Sudan border town of Pagak. We will spend three days in the Gambela region ministering in camps, prison, church and street. The area is largely dry. Crowding is an issue and malnutrition is a struggle. These families live in tents and mud huts, with roofs made from UN Refugee Agency tarpaulins or grass. Despite good intentions, the search for a safe refuge is giving way to despair and hopelessness. As serious as their need for food and shelter, they are in desperate need of HOPE. Human Rights Watch reports that over 400 people have died in violence since August. Tensions have been compounded by political unrest and the country’s worst drought in 50 years. Please pray as we bring the Bread of Life and Living Water to these hurting people. 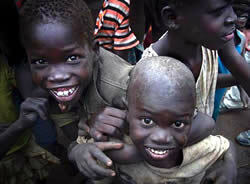 Costs for ETHIOPIA OUTREACH have topped $20,000.00. Your gift of $100 or $200 will help us to cover the costs for the 16 Africa TC leaders who will join us in Ethiopia, the Gambela ministry and outreach in Kule Refugee Camp. Answer their heartfelt cry as you help us to train key African leaders. Because you GIVE, they can GO! Please pray for wisdom, favor and provision as the ALL AFRICA team of 16 leaders has assembled for Mission SOS in Addis Ababa, Ethiopia. Also join us in interceding for a powerful move of God as the team of nearly 150 from the US, Europe, and Africa gathers to share the amazing love of God from November 4-14. 1) The Book of Acts Training School for 2,000 young people will be held in Addis Ababa. Pray as the SOS team trains them in supernatural ministry and God equips them to impact their culture, city, and nation for the kingdom. 3) Pray for team unity, Pray for the TC Africa team. With over 150 individuals from a dozen nations and three continents, there is an incredible potential for the power of God and also a risk that culture and confusion can become a distraction. Pray that we can all check our logos and labels in the airport. SOS MISSION Containers delayed ! ! You have been praying for safe transit of our equipment --stage, lighting, festival sound, and street ministry kits as they were transported from Tanzania to Ethiopia. We need to take our prayers to the next level. The team navigated several border crossings, customs and dangerous roads but the equipment has been effectively stopped somewhere in the wilds of the Savannah in Kenya. Pray they can get the trucks and containers moving again. Please pray for our strategic outreach to the Gambela region. From ministry in the Kule Refugee Camp (over 59,000 including children and families) to prison, street, church, and youth. Over 400 have died in violence in this area since August. Please pray that God will give to us a message of hope and reconciliation. More than praying for safety for the team, please pray for boldness and supernatural ministry. Please continue to pray for Teen Challenge Puerto Rico--for electricity, finances, repairs, food, and water. Not only are they working hard to restore their own devastated facilitates, they continue to reach out to the community and minister to the needs across the island. Has your church or Teen Challenge center considered sending a construction team to Puerto Rico? Please pray for the director of TC Turkey, Lewis Johnson, who was diagnosed with lung cancer. He is receiving chemo and is scheduled for an operation in a few months. He and his wife are believing God for healing. Please pray together with us for his total healing and restoration to the ministry. God has given him an incredible gift of evangelism and is using him to plant new churches by starting Living Free groups. Please pray for our dear friend and brother to be healed.